Hizbul Operative Baba now in Gujrat anti- terrorism squad, had planned to blow of the game recently in Motera Stadium in Ahmedabad. But his plans all got off because of heavy security and personnels in the stadium that has urged him to attack less protected areas like clubs. However, that diabolical scheme, too, came unstuck because the police had intercepted phone calls made between Baba and his handlers. Extensive security arrangements were later made at the club, particularly on the eve of Holi. Some sources has said the he used to call his commander with someone else’s mobile that belonged to Dr.Shah. Baba was told to carry out a complete reconnaissance of the Motera stadium, which he managed to accomplish. However, sources said that he was unnerved by the heavy police presence during the India-South Africa cricket match and decided to change the plan. A late night security drill was undertaken around the Sports Club after receiving a specific input about a terror threat. Some officials, however, said that the drill was a routine affair. Sachin Ramesh Tendulkar- 200 not out! 24th February, Wednesday, 2010 was the date The Maestro created history and made every Indian proud. Sachin Tendulkar- The god of Cricket makes history! of the words which describes The God. Sachin Ramesh Tendulkar, The God of Cricket makes history on Wednesday, 24th February, 2010 in Captain Roop Stadium in Gwalior with a breathtaking inning scoring 200 runs and not. Perhaps, no one would have thought in the start of innings that he will score the first double century and become the highest scorer in a match. Sachin! Sachin! Sachin! All the way. People would have been cursing MS Dhoni who was aiming to take the score to 400 runs and did not give strike to Tendulkar in the end overs. He scores 200 mighty runs in just 147 balls to prove that he is the God of Cricket. Everybody’s hearts would have been in their mouth when he was for the first time in his life in nervous 190s. But, as everyone wanted, he went on to score the double ton. Everyone stood and cheered the Master Blaster on his maiden double ton in jam packed crowd in Gwalior. His inning of 200 runs in 147 balls consisted of 25 fours and 3 sixes. Making it 118 runs in boundaries. Sachin Tendulkar has not only made the Indians proud but all the fans of Cricket. Hats off the this almighty. Its indeed a great performance by the South African bowler Dale Steyn and both the test batsman Jacques Kallis and Hashim Amla. Its a shame for a No.1 for best defeated by a inning and following on. The result was obviously known a day back when India were struggling at 220-7. But although, today The Indian batsmen put a very good fight. They closed in all just were short of 6 runs to avoid innings defeat which would have saved some pride. But, all has gone now. We can pat the backs of the South Africans. Meanwhile, it is my duty to elaborate on my team and some of the good performances by them. First of all, Tendulkar’s hundred. He was the performer of the Day in India’s point of view. The master of cricket is always there to save a match for India. He tried doing so but in the process there was not enough support for the Maestro. His hundred came under heavy pressure. It was even more than Blaise Pascal’s pressure capacity. Hmm, Tendulkar is great doing that. But he tried his best. No support in the other end couldn’t make his efforts successful. Dhoni gave him a partnership but that was not enough. Badrinath’s role too was small. 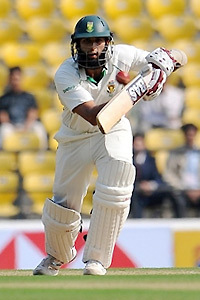 I was amazed with the batting of new Lad Wriddhiman Saha who missed out of a half century. He tried his best to save the day as he scored a 36 runs. He had good support from Harbhajan and Zaheer Khan with whom he had 50 run partnerships. Harbhajan played as if it was a One Day game. He soon got out for an Leg before scoring a cameo of 39 runs. Zaheer’s support was excellent. He his 2 sixes in the process. It looked so that he would go on to score a fifty but was in a urgent and gave away his wicket cheaply. As said, when a wicket falls other wickets start to fall. This happened so when Steyn came back to bowl. First Saha fell for a LBW, then the last wicket Amit Mishra. At Last, India fell short by 6 runs to avoid innings defeat. Hope this never happens in Eden Gardens. Surely, the visitors are holding the driver’s seat in this game as Hasim Amla and Jacques Kallis continued their brilliant partnership. Kallis soon got out within half an hour but Hashim Amla’s 11 hour stand facing 473 balls and scoring 253 not out ensured the total of 558 for 6 when Greame Smith told enough and declared the inning. With the three overs remaining in the day, the Indians were asked to bat it out to save their wickets and both the Delhi Dashers did so scoring 25 brisk runs in a span of 3 overs. The Indian Middle order will be tested tomorrow as the South Africans have managed a great 558. Amla marathon performance was superb as he sent out a strong word to Indians telling that don’t ever be casual of out side. The bearded Visitor’s class was superb and his timing excellent as the Indian bowlers were struggling to take his wicket. AB De Villiers too supported him at the other end scoring 53 to add to the 4th wicket Partnership but failed to continue as he was holed by Sehwag’s spinning delivery chipping it to the point fielder. Duminy, couldn’t find his form as he fell for a Leg before for just nine runs walking back to the hut. 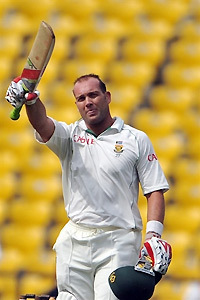 But Boucher supported the Double Centurion almost till the end scoring a cameo but fell to Zaheer Khan. As Amla scored his 250, Greame Smith declared the innings. It was another great day for the Visitors who rattled India. Kallis and Amla lead The Proteas! The World Championship of Cricket started in Nagpur’s VCA Stadium today. The South Africans won the toss and chose to bat. India’s most experienced bowler Zaheer Khan struck both the openers home. First Ashwell Price went for a duck attempting for a shot. Next was amazing as the Proteas Captain, Greame Smith was clean bowler for 6. They were 6-2, but it went on to score 291 for 2 at Stumps, Day One. Dhoni’s logic of not attacking the new batsmen was wrong and because of that they had freedom to settle. Instead of Bowling Zaheer, he opted for Part timer Sehwag. That caused all the havoc for the Indians. Both Amla and Kallis continues for a great 285 partnership. Both of them scored centuries. Kallis played with greater poise and authority in the second session. He negotiated both medium-pacers and spinners with equal felicity. Every time the two seamers chose the corridor of uncertainty, Kallis chose to shoulder arms. The ones going down the leg side was dispatched with disdain. He batted impressively against both Harbhajan Singh and Amit Mishra. He smothered the spin with soft hands and read Mishra’s surprise googlies well. The two spinners did bowl occasional loose balls and Kallis invariably pounced on them. The 34-year-old veteran paced his innings with extraordinary care and resilience and carved out a chanceless century to rescue his team. He peppered his fine innings with 13 fours and 2 sixes. Lets see what happens tomorrow! Probably, The Africans won the day except for the first session.